As you know, hair loss, or alopecia, can be a hefty emotional toll on women. Society has forced women to suffer in silence as their crowning glory is stripped from their scalp, robbing them of their confidence, feeling of youth, and inner vitality. The psychological impact and effect hair loss has on women can eventually affect physical health, and the issue must be taken seriously. Focus groups show that women do not want products geared for men. There is a huge market need for targeted female hair loss solutions. The hair loss market is dominated with solutions for men – where can you get answers? 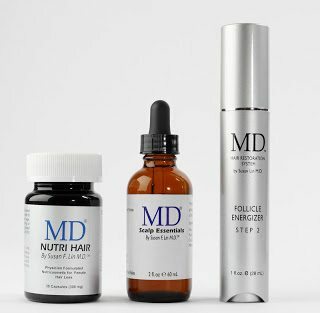 MD® Hair, our exclusive line targeted for female hair loss, is specially formulated by Dr. Susan F. Lin, a practicing physician in women’s health, anti-aging and aesthetic medicine for over 21 years. MD® Scalp Essentials is our fast-acting, easy to use hair serum designed to immediately soothe an inflamed and itchy scalp, as well as help treat its causes and symptoms. The active ingredients can swiftly re-balance the scalp by dealing directly with excess oil and in turn, fungus to relieve irritation. It also helps block DHT, the enzyme responsible for hair loss. MD® Nutri Hair is our simple, one-capsule daily supplement designed specifically for thinning hair. It includes lilac extract derived from plant stem cell technology for optimal potency and purity. Fortified with nutrients such as biotin, antioxidants and omega rich flaxseed meal, these clinical strength ingredients favor protein synthesis and hair growth. MD® Follicle Energizer is our clinically tested formula, using zero harsh chemicals and directly addresses female hair loss. Women have a chance to renew their confidence by improving the appearance of their hair in volume, thickness, and health. This physician formulated product is designed to be safe, result-driven, and easy to use. Long term results are seen in as little as 4 weeks! MD® Hair will help renew your confidence and restore the appearance of healthy, thicker, and voluminous hair in weeks, not months. Check out MD Hair today!